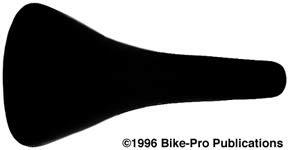 Velo is a Taiwan manufacturer is bicycle saddles, whose products have historically been sold in the United States, under other companies brand names. Their work the quality many riders seek. The Velo Titanium Race saddle is the basis on which the WaveFlo Elite saddle is built, so their similarities are understandable. The saddle uses a molded nylon shell, with softness provided from molded high density foam padding. The foam padding contours the shell, feathering to thin edge at the sides.